This weekend we’ve been focusing on the hugelkultur swale. Anyway, we had a ton of weeds come up in the swale because it was one of those projects we built to achieve a specific result (staunch water run off) and once we got that result, the completion of the project got put on the back burner. Well fast forward a few months, we had some hornets or yellow jackets build ground nests in the clumps of dirt surrounding the swale and after several stings, we let that project slide even further, hence weeds. 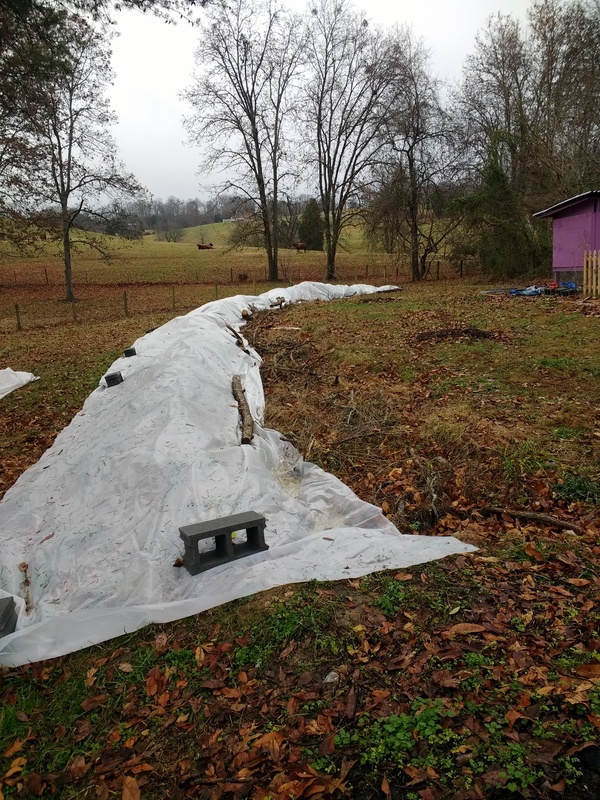 We covered the “hill” of the swale in thick plastic (I would have preferred black, but my husband got this mostly opaque plastic sheeting for free) to kill off the grass and weeds. Once that’s done, we’ll likely cover it in either wood chips or straw to keep unwanted growth down until we plant something in it. I’m thinking either Egyptian walking onions or squash/melons. We’ve been filling up the swale with branches and limbs from the trees we’ve been clearing all year, and eventually (hopefully in the spring) we will fill in the rest with wood chips and leaf and grass mulch. The long term goal is to create a sustainable hugelkultur swale into which we can plant a variety of veggies or fruit trees/bushes. 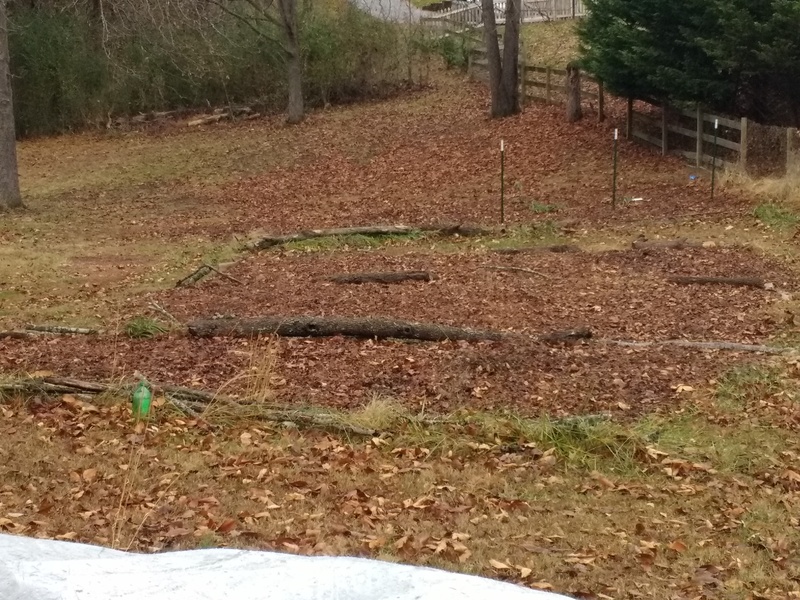 Theoretically, the nutrients produced by the decomposition of the logs and mulch over time should work with the natural slope and terrace garden to water and amend that soil all the way down. That’s the theory anyway, and we’ll see how it plays out. 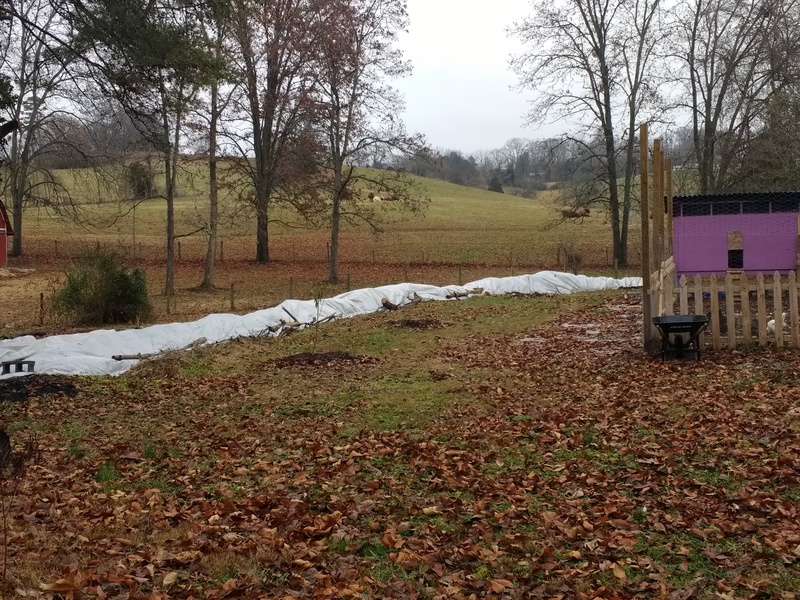 We also had several trees still in grow pouches and we still aren’t really sure where to plant them, so my husband set them up on the south side of the house surrounded by wood chips for insulation and we hope that gets them through the winter. We considered bringing them indoors, but decided against that in favor of natural sunlight and rain. Mr. 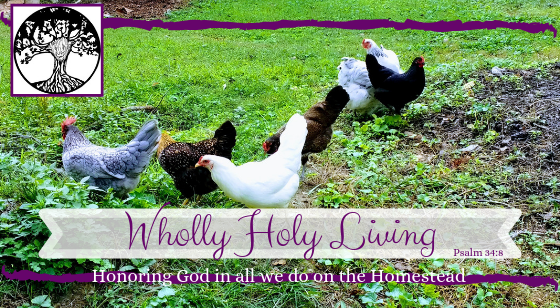 Husband also wood chipped and leaf mulched around the fruit trees we planted this past spring where it had just broken down or the chickens scratched through it all. That should make for some nice topsoil and nutrients as well as moisture retention for them come spring. We’re still waiting for a good hard freeze before we prune anything. It’s just better to do that while the tree is dormant in my opinion. I’ve done “emergency” pruning year round when the tree needs some help or has sickly looking branches, and it is fine in a pinch. But for the “big” prune, we wait until the trees are dormant, usually late January to mid February. What Spring preparations are you making this winter?